If there is a confluence of food from all over India –North, South, East and West, and other parts of the world—it is in Hyderabad. The Hyderabadis believe that not for nothing God created the sense of taste and one is what one eats. No effort is spared, even at the expense of health, or any occasion, to exult in its taste. In any social gathering there is always an extensive discussion of food with pride in its distinctive ingredients and preparation and historical references. It pervades from homes to street corners. Essentially, it is the tool of communication. It is pursued with artistic passion, Khoolse and Mohabbath. Khate waqt aata hai dost/Sote waqt aata hai dushman. Hyderabad enjoyed a long period of peace and prosperity under its kings, and later under the British Colonial rule. There was lots of time and personnel on hand to cultivate their passion for food. The Hyderabadis did not invent any weapons of mass destruction, or aspired in reality to land on the moon, though the lovers promised the moon to their beloveds. Instead, they invented the famous Biryani, Bagaray Baigan and Double ka Mitha —signature dishes –the first identification asked or expected of a Hyderabadi. The khatta (imli- from the tamarind tree) in Bgaray Baigan is indicative of the Telengana influence, and spices of the Deep South. Spices are used in many meat, vegetables and daals. Even the leaves and flowers (chigur) of the tamarind tree, plucked in early spring, are relished with gusto — as one Hyderabadi poet wrote: Deccan Ke hain do mashoor saalenan/Ek imli ka patta, ek baigan bagharey. Of course, the health benefits are cited in its indulgence. Ambada, another sour leaves, botanically related to the marijuana family of plants, competes with chigur cooked in chikna gosht and dried prawns. In foreign countries, away from the Deccan, lemon juice has supplanted imli —a pakka Hyderabdi will sense it right away in one morsel. Aamchoor, the dried green mango is another sour ingredient the Hyderabad cuisine boasts. This pinch of khatta is true to what the poet Sarwar Danda wrote about Hyderabadi saalenan. Undoubtedly, a Hyderabadi is a ‘compulsive meat eater’, but the influence of South India cannot be discounted, especially with the influx of people from Andhra who have set up several vegetarian restaurant that serve dosas, upma, vada , saambar and the like. These dishes need an acquired taste to relish, and some Hyderabadis, in spite of being compulsive meat eaters, have begun to eat and accommodate their presence side-by side with the non-vegetarian dishes of meat derived from goats, lambs, cows and chicken. We may also include the maral fish — a delicacy not found anywhere else, and in texture as good as meat. A thing to note is that almost all parts of the four legged animals are used in several ‘weird’ dishes also. For example: the tongue and totters in Nahari, the stomach offal’s together with jeeb jabray , brain and the eyes from the lamb head are also included in the hot and spicy Chaakna — not to forget the bone marrow gud dish. Historically these were the entrée of the common people like the soldiers, peasants, or domestic servants until unwittingly made it into the royal and elite household – to become unique delicacies to some Hyderabadis. Usually these are eaten with different kinds of bread: naan, paratha, or phulka, and the modest peasant’s bread jawar ki roti. 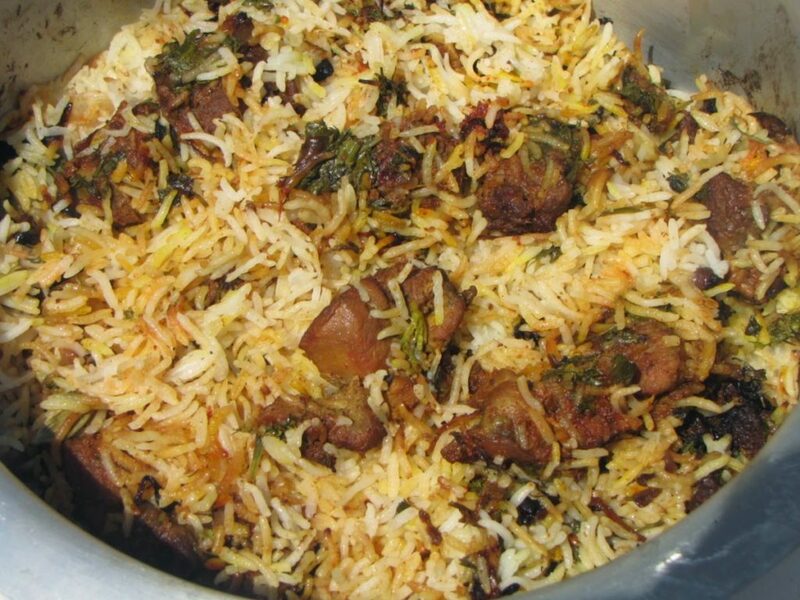 But rice remains staple grain cooked in a variety of ways in biryani, palau, kichri with preference for Basmati rice. The meat is also cooked in different forms of curries –khorma, pasindas, shorva, pathar ka gosht. Hyderabadis are fastidious in selecting the proper cuts of meat for specific dishes, especially in biryani and pasinda. When cooked with vegetables, fatty meat attached to the bone is preferred in gawaar, ambada, same ki phalli—not to forget in daalcha with kaddu. Meat grounded into keema also takes its creative form in Kabaabs, Koftas, or just plain keema to be included in the standard breakfast of kichri, papad, dried hot chilies, badees, achaar and imli ka khatta. It is hard to believe how far the Hyderabadis can go in quest of taste when some of their dishes like kadi, shaami, and lukhmi taste the best when kept over- night. Add to this the bagaar —consisting of dried chilies, cumin seeds, mustard seeds sab zeera, til, pathar ka phool etc. These ingredients are a combination from all corners of India, and the Arab and Turkish acquisition is seen in the use of seeds like shab zeera, khas khas, and magaz and kabab chini. It is worth noting here that the food is also flavored with cardamom – a mixture of South and North, which makes the food “tantalizing” and delicious. One of the talents of any cook is to extract the subtle flavors of the spices when used with the standard ginger and garlic. The mixture may not be measured in exact level of teaspoon, or other sophisticated measuring cup, instead in chutkis of fingers. The garam masala is a good example of the informal exactitude or balance achieved in those chutkis. Another way in pursuit of taste in the old fashioned way is to cook in clay pots (Haandi) to get the flavor of mother earth, and on granite too when the meat is cooked on heated (by coal) granite slabs, or in the North Indian lagan. There are variety of ways meat is seasoned and cooked, the Turkish Sheesh Kabob, boti kabob, mutton or Chicken, are examples of adaptations by the Hyderabadi cuisine from different parts of the world. A few leaves of karya path are enough to enhance the taste in any curry or daal. Believe it or not, many cooks do not cook if they find a particular spice is missing. They take it as a serious threat to their reputation, or they do not want to lose the appreciation of the invited guests the missing ingredient might result in their preparation of the food. Thus, along with food goes the loving hospitality at all levels of Hyderabad society. Housewives, men, peasants, domestic cooks both rich and poor take special care in displaying their cooking skills for their families and guests. It was rumored that Maharaja Sir Kishen Pershad, the prime minister in the Nizams’ rule, was so fond of cooking that he could cook daal in ‘fifty two different ways.’ Even the Nizam, Mir Osman Ali Khan was adept in setting the menu in his own hand writing. What more can be said of Hyderabadis passion for food that kulcha was an emblem on the flag, though for a diferent reason. Words of welcome are written on the dastarkhans (table cloths) with ‘ Be thankful to god that a guest has come, to eat his own food on your dastarkhan.’ Imagine the ease with which a guest could ‘fill up.’ Over eating, is never considered impolite, though stacking the plate begins with many facetious hesitations. During the meal, the laws of hospitality do not permit to offer water to the guest. The Hyderabadi must retain the maximum space for the lavish food instead. Preparation of deserts was a long and meticulous ritual, and no meal ended without it. Several days of gentle labor went in making the baadaam Ki jaali — the soaking and pealing of almonds, then grinding and mixing it with associated ingredients to see it came out in the shape of jaali (screen) unbroken. Though double ka meetha was a standard dessert, there are the khubbani ka meetha, and kheer. The North and Arab influence is seen in desserts like gulab jamon, nimish and khajoor ka halva, and anday ke lauze . Unlike the salty dishes, there is less variety in desserts, though it has been known that the founder of Hyderabad Sultan Quli Qutub Sha had a sweet tooth. During the meal, the laws of hospitality do not permit to offer water to the guest. The Hyderabadi must keep the maximum space for the lavish food. However, Hyderabad can boast of some unique drinks or sherbets, not used as culmination of a meal, but to mellow the summer heat or to be served as refreshment. Most famous being the Kairi ka Abshola made from the pulp of green mango, or Mango Phool from ripe mangoes mixed in cream and khowa. A berry unknown elsewhere, the faalsa berry sherbet soothes the oppressive summer days, and the most surprising, the chemical free, pure juice tapped from the Palmyra tree called Neera —unadulterated, it remains non-alcoholic until the sun rise. It ferments and turns into toddy. The choice is yours. Different concoctions of yogurt in the form of lassi, a sure import from the North graces the palate of Hyderabadis who also prepare exotic flavors of ice screams: cheekoo, figs, custard apple, papaya, mango, cantaloupe etc. Sometimes ice cream is served as a dessert with cakes and pastries to go along with it, but only as substitute to the real dessert. The meal comes to a full circle with tea complemented with Paan, which is prepared with an elaborate ritual, and served with style and grace. When offered, the guests accept it with a gracious salaam. At the present, in Hyderabad, all kinds of Western and European, Middle Eastern, and Afghani cuisines are available in several restaurants, five stars hotels, and private houses. The Dhabas serve North Indian foods, while Andhra restaurants focus on the South Indian dishes. The Chinese have married the Hyderabadi cuisine with their own to a distinct taste well- liked by the Hyderabadis. All foods are relished by the Hyderabadis, but with the present of so many varieties, the past beckons to them in their houses and festivals in an ambience of nostalgia, which is jelled in biryani. Hyderabadi cuisine is the very epitome of India’s composite heritage. Its food is a juncture of ‘several cultures and identities, Indian and foreign’ to be considered as the food capital of India.